Toviaz is the brand name for the antimuscarinic drug, fesoterodine. 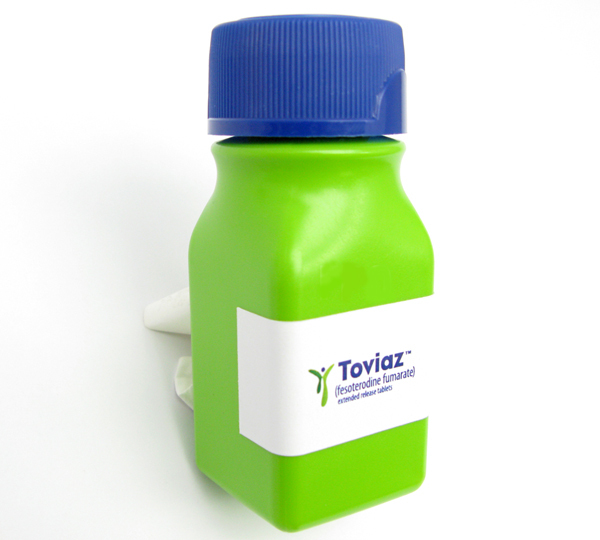 Developed by Schwarz Pharma AG, Toviaz was approved by the Food and Drug Administration in 2008 for the treatment of overactive bladder syndrome. Toviaz is generally well tolerated and has a low occurrence of serious side effects. Toviaz is available as an extended release tablet in 4mg or 8mg that is taken orally once per day. It is important to follow your doctor’s instructions exactly when taking Toviaz, as improper dosage may increase your risk of developing common or serious side effects. Always swallow Toviaz tablets whole; do not break, chew or crush them. Toviaz should be taken at the same time each day to get the maximum benefit from the medication. Toviaz (fesoterodine) is prescribed to treat overactive bladder syndrome, a condition that causes the bladder to contract uncontrollably. These bladder spasms result in frequent urination, incontinence and feelings of frequent urgency. Toviaz works to alleviate these issues by relaxing the bladder muscles. Despite the long list of side effects, many patients find Toviaz to be an effective way to relieve the symptoms associated with their condition. Toviaz has to be used orally, with or without food. Toviaz is usually taken once a day, or as directed by your doctor. The extended-release tablets should not be crush or chewed; when doing so, the medicine is released all at once, increasing the risk of side effects. It is advisable do not split the tablets unless your doctor instructs you to do so. Dosage of Toviaz is based on the medical condition of the patient. Do not change the dosage yourself without your doctor’s advice. It is advisable to take the medication regularly with the aim of getting the most benefit from it. It is better to take the tablet at the same time every day. Inform your doctor in the case of heath condition does not improve or if it worsens. Dry mouth is the most common complain of patients taking Toviaz . To relieve dry mouth it is advisable to drink plenty of water. Constipation is another common complain. To prevent constipation it is recommended to maintain a diet enriched in fiber, drink plenty of water and exercise. Consult your doctor if constipation persists during 3 or more days, severe abdominal pain, signs of kidney infection (fever, lower back pain, painful urination). Consult immediately your doctor if any of these rare but serious side-effects occur: palpitations (fast heartbeat), fainting. Toviaz should not be used in case of some medical condition such as: urinary retention (problems emptying the bladder), gastric/intestinal retention/obstruction (severe blockage of stomach or intestines). Inform your doctor if you have any of these symptoms. Toviaz causes decreased sweating. Avoid becoming overheated in hot weather, saunas, or during strenuous activities because a stroke may occur. Kidney function declines as people grow older. Older people are more sensitive to the negative side-effects of fesoterodine because this medication is eliminated through urine.